"One for the Gallery Wall"
The first layout, won the Reader's Pick Poll, thanks to a lot of you who are my faithful Blog readers for your votes. This layout was actually my first DT layout for Frosted Designs and I just wanted to have a lot of fun with it and create a great Summer look. 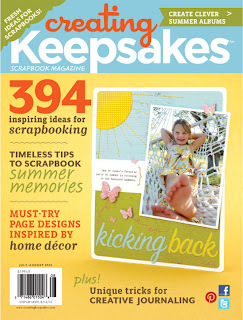 "As seen in the July/Aug 2012 of Creating Keepsakes magazine. Copyright Creative Crafts Group. Posted with prior permission from the publisher." These next two layouts were done for an assignment I received from CK. They both appear in the article "One for the Gallery Wall". This was a really fun assignment, because I was asked to create two different layouts, using photos from a vacation. The focus of one of the layouts needed to be about the vacation and the focus for the other had to be family, but used in a frame. I chose to do a layout for the second part of the assignment and purchased one of the black 12x12 frames. These are great, because you can display your layout as wall art and most of these type frames have different levels to set your glass, depending on the height of your embellishments. So, this is just a little taste of what you will find in the July/August issue. If you are not a Subscriber, you'll definitely want to pick this issue up at your nearest store. Or better yet, become a CK Subscriber and have it delivered right to your door! Yes! I am a fan of CK and received the issue in the mail last week. I noticed all your beautiful layouts. Sooooo exciting for you. Sooooooo excited for you!! HUGE CONGRATS!!! Loving your projects!! Just gorgeous!!!! Congrats again Ashley, all three projects are so beautiful and it was fun to see a friends name in CK!! All your projects are fabulous! It's so exciting to see someone I know in a magazine. Congrats Ashley!! Your work is amazing and I'm sure we will be seeing more of your work in print!! YEAHHH!!!! That's awesome! I can't imagine how excited you get seeing your layouts in CK! I get excited that your layouts are in CK! The last one of yours that was published I was like "I know her!" lol!! They're all awesome layouts, my favourite is the first one, it's such a great summer layout! I can't even imagine how exciting it is to see your wonderful layouts in CK. All are super layouts, thanks for the inspiration and great ideas! I noticed those and was so excited for you! Very happy for you, Ashley! I got my issue and was so excited to see your projects in it! - congratulations!